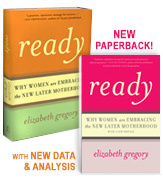 Here’s a link to a report from the CDC out today on the global rise in later motherhood. Exciting to be cited as a reference! And here’s another link to a related story in USA Today, including some input from yours truly.